Pride without prejudice – how Jane Austen came to appear on our coins and banknotes in 2017. 2017 marks 200 years since the death of Jane Austen – one of the best-loved English novelists of all time. And to celebrate such an inspirational female figure, both The Royal Mint and the Bank of England chose to honour her on a brand new coin and banknote. Back in May 2013, a petition to ‘keep a woman on English banknotes’ gained momentum. Over 35,000 people signed the petition after it was announced that Winston Churchill would replace social reformer Elizabeth Fry as the face of the £5 note in 2016. At the time this meant that other than the Queen, there would be no women featuring on English banknotes. However, people power won as Jane Austen became the new face of the polymer £10 note in 2017, replacing Charles Darwin. It is thought that Jane Austen was already part of the Bank’s plans for the next new note as in a statement the Bank said it was “never the Bank’s intention” that none of the four characters on banknotes would be a woman. The Bank of England have featured characters on their banknotes since 1970 to celebrate individuals that have shaped British thought, innovation, leadership, values and society. Jane Austen is the 17th historical figure to feature on a Bank of England note. So not only does Jane Austen feature on the new £10 note, The Royal Mint also feature this inspirational author on the new 2017 £2 coin. 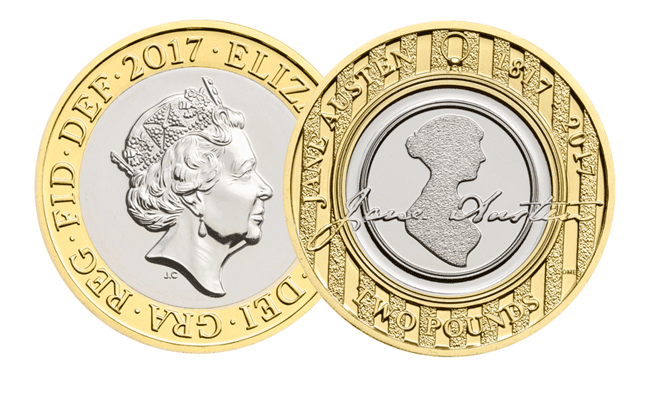 Designed by Dominique Evans, the new £2 features a silhouette of Jane Austen with the dates 1817-2017. The £2 coin issued by The Royal Mint has been struck to mark the 200th anniversary of the death of Jane Austen, one of the best-loved English novelists. This £2 for 2017 was struck to mark the 200th anniversary of the death of Jane Austen. This was the first time ever that someone featured on a circulation coin and banknote at the same time – other than the reigning monarch. A tiny portrait of Jane Austen also appears on four of the new polymer £5 notes as a microscopic engraving produced by Specialist micro-engraver Graham Short. The collector’s items are said to be worth over £20,000 each! for you to get it back. Maybe it’s an optical illusion, but the pictures I have seen of Jane Austen £2 coin seems to have a wider ‘gold’ section around the edge than any other £2 coin. But no one else seems to have remarked on it so I presume it’s just my eyesight? !